After more than four months that my SmarterSteuer app was on the AppStore, I decided it was time to extend the application a bit. To recap, SmarterSteuer helps freelancers and self employed people like myself to figure out how much tax is owed and allowing them to save some money. 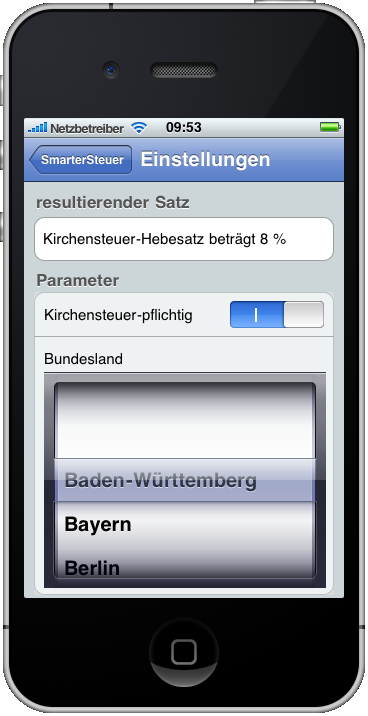 V1 is a pretty simple app – just one screen, no options or sub-dialogs. 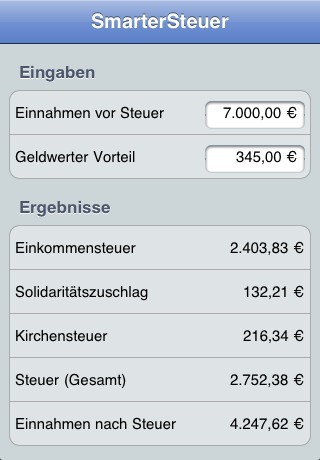 The addition I had in mind was with regard to “Kirchensteuer” (church tax). In Germany, when you are a member of one of the registered national churches (either Catholic or Protestant), the state collects a certain percentage and forwards it to the appropriate church. The amount of church tax is based on the income tax, but the percentage is based on which state (“Bundesland”) you live in (either 8% or 9% of the income tax). Also, when you’re not a member of a church, you don’t have to pay church tax at all. 9% church tax (when you are living anywhere else). But then the user would have to know whether she lives in a high or low rate state. I could add some text to explain which is which, but it wouldn’t be very intuitive. 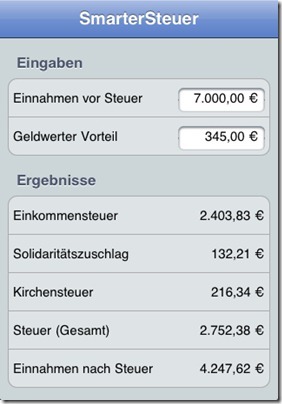 The resulting tax rate (“resultierender Satz”) is then displayed at the top. This was very close to what I wanted, but I couldn’t really style the buttons with the proper background color. I’m not really sure why it didn’t work (see StackOverflow question #6496441), but I just couldn’t make it work. The tricky bit was to make sure that any gestures on the picker did not get picked up by the TableView. 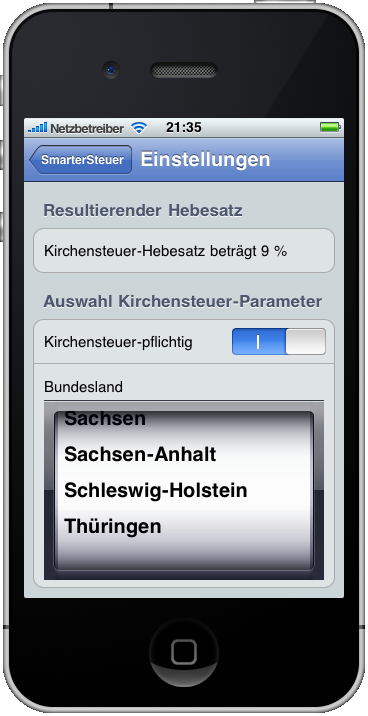 The only solution I could come up with was to set the whole TableView to scrollEnabled = NO. 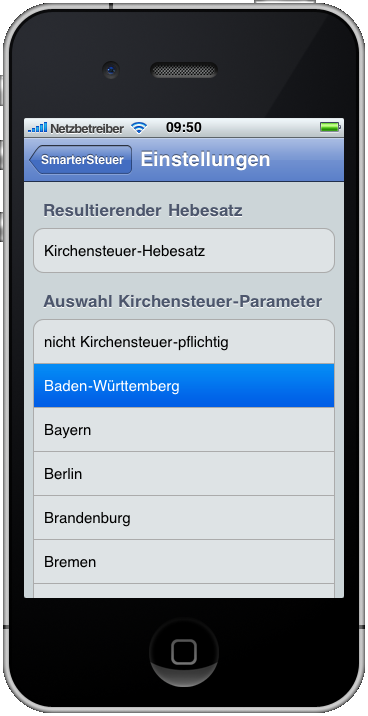 This works because the TableView is not larger than one screen, but it feels a bit like a hack. If you’ve got a better idea, look to my StackOverflow question #6711878. Finally, this version was good enough for me to release it as version 1.1 of SmarterSteuer. It is available on the AppStore!